1. As you can see from the videos I posted, John is really growing and developing fast. I am really enjoying this stage. He is smiling a lot more. There is nothing better than when I glance over at him and his face lights up with a big grin. I feel loved. 2. Adjusting to John's schedule has been a challenge for me. For the first two months, I lived by his routine (which was non-existent). My mom suggested that I try to formalize a nap time for him. This has helped tremendously! He takes a nap from about 11:30 to 2:30 every day. With this time, I am able to get things done around the house... or take a nap with John. My naps are not nearly as long as his, so I can usually take a brief nap and then get stuff done. Sometimes he takes cat naps in the evening, but that is not guaranteed. 3. Now that John is on a schedule and I have more structured time, I have also added structure to my duties in the home. Mondays are menu day, Tuesdays are floor day, Wednesdays are surface day, Thursdays are laundry day, and Fridays are organizing day. In addition, I have instituted "Muffin Monday" and "Cookie Wednesday." I put all of these days on my google calendar and it sends me a reminder every day. I have been good about getting the floors cleaned on Tuesdays, but the other days have been challenging for me. I hope juggling these tasks will get easier. I think I am off to a good start in just trying to be more purposeful about my duties. 4. Not only has John been taking naps, but he has been doing so in his co-sleeper. Up until a week and a half ago, John was sleeping in our bed all night and sleeping in random places for his naps (the swing, his car seat... where ever he happened to fall asleep). Now I put him in his co-sleeper for his nap and he starts out the night in his co-sleeper but then joins us in our bed when he is ready for his night-time snack (around 2:30). I figure if he begins the night in his co-sleeper, he will just stay there when he starts sleeping through the night. This has been a difficult transition for me because I love sleeping with him! But I know this will help him transition when it is time for him to have his own bed. 5. We went to Joe and Anna's wedding last Saturday. They are friends of ours from Bellingham. They have both been living in Minnesota for the last few years. Now that they are married, they will be living here in Washington. We are excited to have them close again! 6. Tonight we welcomed Sr. Mary Joseph into our home. She came up from California to help with Vacation Bible School at Star and will be staying with my parents for the next week. I am excited to have her here and we feel blessed to have her as our guest. 7. John will be baptized on Sunday!!!! Yesterday we received our first batch of cloth diapers in the mail. We bought three Bum Genius 3.0s, seven Indian pre-folds, and a Bummis diaper cover. So now we have enough to do cloth diapering at least every other day. It will be nice to have two different styles - so we can see what works best for us. The Bum Genius diapers will probably be the easiest, but the Indian pre-folds are more economical. I'll keep you updated on our adventures! John was so cozy with Uncle Aaron, he fell asleep! A few days after that, he began to roll over! He is growing so fast! We are so proud of our amazing boy! 2. 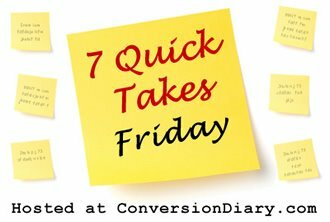 I have been trying to go to daily Mass at least two times each week. It is so hard to get out of bed! However, I was successful this week. We went this morning. Now that John is talking a lot (yeah! ), he has also started talking during Mass (boo!). I am looking forward to the time when I will be able to reason with him and teach him about reverence. For now, his coos during Mass are precious and not too disturbing - I hope! 3. I finished unpacking everything in the kitchen. It feels good to have one room organized, but all the other rooms need a lot of work! 4. Here is a quote from what I read this week out of the terrific book I'm reading (How to Change Your Husband): "Many would agree there are few who would be considered 'gentlemen' in our society today. Why is that? How many women today are really sweet and gentle on a continued basis? Who is it but mothers that can teach gentleness to little boys and girls? Look at how few mothers today are truly gentle, and if it is so in public, does a gentle spirit truly prevail to their children behind closed doors? Until we have real and true 'gentle-wives' and 'gentle-mothers,' we will never have 'gentlemen.'" 5. Andrew's back has been giving him trouble. He had to work from our apartment for a couple of days because he could barely walk. He is doing a lot better, but still needs healing. Please keep him in your prayers. 6. John is growing out of some of his clothes! Yesterday I went through the clothes that I had stored because they were too big. I pulled out a bunch that will fit him now. He is growing so fast! 7. 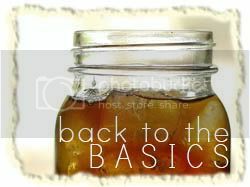 A look ahead: My mom and I are going to learn how to make jam tonight at our friend's house. It should be fun!! This weekend is pretty open, which is unusual, so we are looking forward to getting more things done around the apartment. This is the first week in the series and the topic is creating a family mission statement. Lindsey's favorite: Twenty(ish) years from now, Father John St. Hilaire will discover this photo in his baby book and think, "Oh, now I get it." Andrew's favorite: Fr. Maurer to John - " I don't think that liquid goes with my cassock." 1. We've moved!! Today we rented a U-Haul and lugged all of our stuff to our new apartment. Now begins the fun of unpacking and organizing (I'm not being too sarcastic, I am actually excited to do the organizing!). 2. Last Saturday we went to Moxee for the St.Hilaire family reunion. We drove over with Lou and Jenna (Andrew's brother and sister-in-law). It was a good drive and John did well in the car on the way over - the way back is a different story - John screamed louder than I have ever heard. As soon as we were able, we pulled over and comforted him. The reunion was very nice, however we were hoping more people would be there. However, we were pleased with the company we had. 3. Becky, or "Perky" as I call her, has spent each day this week helping me get ready for the move. The grand finale was today. She spent around six hours today helping us move. It is such a blessing to have a friend who will give up her whole week to help. 4. I have my husband back! He has been spending most of his nights for the last two weeks working on our apartment. He has done a beautiful job, but John and I have really missed our evenings with him. It will be so nice to be able to have family time again. 5. In the craziness of our move, Dymphna (our pet chicken) has gone into her nesting mode. When she does this she lays in one spot and flattens herself close to the ground. We call her a "pile." She has been laying a lot of eggs lately, so she deserves a rest. We hope she doesn't nest for long because she is a lot more fun to be around when she is active. 6. John has been smiling more lately. I like to squish his cheeks together and he seems to enjoy it as well - I know this because he gives me a cute little grin (check back for pictures!). 7. We are really excited to enjoy the 4th of July in our new home. The view from the fire station is amazing! You can see all the fireworks in Bremerton from the deck. 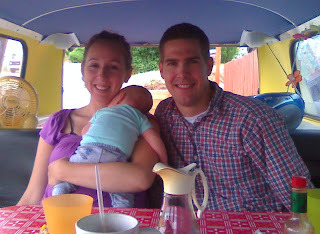 A couple of weeks ago, our friends Cory and Athena (and Joseph) came to visit us. We had a wonderful time catching up! Cory is currently in dental school in Arizona, so we don't get to see them much anymore. We really miss them! Cory and Andrew were roommates when they lived at the Xavier house in Bellingham - and - Athena and I were roommates at the Sienna house. Athena is pregnant with their first son, Joseph. When she held John, she was holding two babies! She said Joseph kicked John while she was holding him. How cute, they are already playing together! Before they left we went to Mass and out to breakfast. 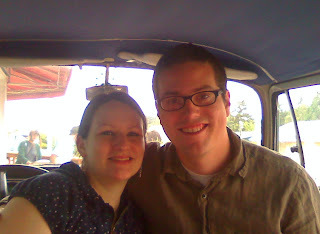 We took them to one of our favorite diners in Bremerton called "Hi Lo's." When we got there, there was no seating available for all of us - or so I thought! 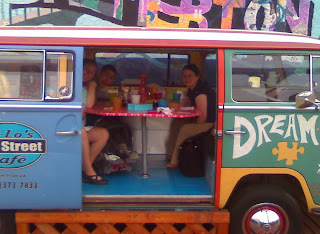 Because the resturant was full, we got to go sit out in a hippi van! I did not know about this feature of the diner. They have a van outside that is refurbished. It has been transformed into a dining booth! It was SO fun. Too bad we forgot our cameras! But I did take some pictures with my phone. Thanks for the good times Cory, Athena, and Joseph! We love you!